They say location is the most important part of finding the right home and this one offers one of the best around! LOCATION LOCATION LOCATION is a spacious one bedroom 1.5 bath log cabin located in Eagles Ridge community just one mile from the heart of the action in Pigeon Forge. Access The Island, Dixie Stampede, Dollywood, and everything Pigeon Forge offers without any steep mountain roads! Upon arrival see twin access parking spots. Outside two full length porches, include screened back porch - home to a bubbling hot tub and comfy patio furniture. Inside a vaulted open floor plan with hardwood floors includes stone/gas fireplace, full kitchen, dining area, sleeper sofa & LED TV. The King master bedroom on the main level with in- room Jacuzzi & LED TV includes an attached bath w/ shower. 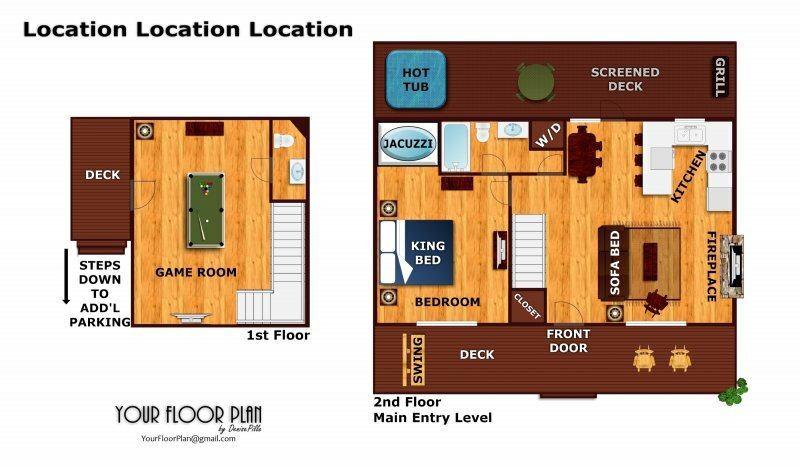 Head downstairs & enjoy a game of pool in the game room w/ 44" LED TV & 1/2 bath. If you've been searching for that perfect LOCATION LOCATION LOCATION, then call and book your stay! The property was in a good location and had a great time. The property was very clean and had all the things we needed. Would defiantly stay at the property again, great value for the money and the location. We stayed in Location, Location, Location. The cabin was above expectation and very clean. This was our first time to Gatlinburg and will definitely be back again. I will definitely use Patriot Getaway again for our next trip! We always use Patriot. Exceptional customer service and properties. We look forward to our next visit! My husband and I have stayed in multiple cabins and hotels while vacationing in Gatlinburg; however, weve never stayed somewhere as amazing as this cabin. The customer service was wonderful! The cleanliness of the cabin was beyond a superior level! We cant wait to book with you again!